Happy Meatless Monday! (Or happy meatless Friday during Lent? That works too.) Here’s a combo I’ve been playing around with since the fall and I think I finely perfected it — Sesame Spaghetti Squash with Tofu. What really make it is the sesame tofu from Whole Foods. Yeah, it’s probably fried and high(ish) in sodium, but it’s so tasty and takes this veggie dish to the next level. Not a tofu fan? Just as good with chicken. Already tasted it for you and you still have the sesame flavors from tossing everything with soy sauce and toasted sesame oil. Also, another fun fact is the smaller the spaghetti squash, the more it’s like angel hair pasta versus spaghetti. Ever since I got a sore throat, I’ve been craving a bowl of miso soup. Sounds weird, but sometimes chicken noodle just doesn’t cut it for me. Miso soup is Japanese soup known for its tangy, salty and unique, yet powerful flavor. The miso paste comes from fermenting soy beans. The soup is minimal, quick and easy, and quite different. My Akron family has a knack for growing beautiful kale, and my parents swung by yesterday to check in and drop off some kale, which adds a hearty addition to an already minimal soup. 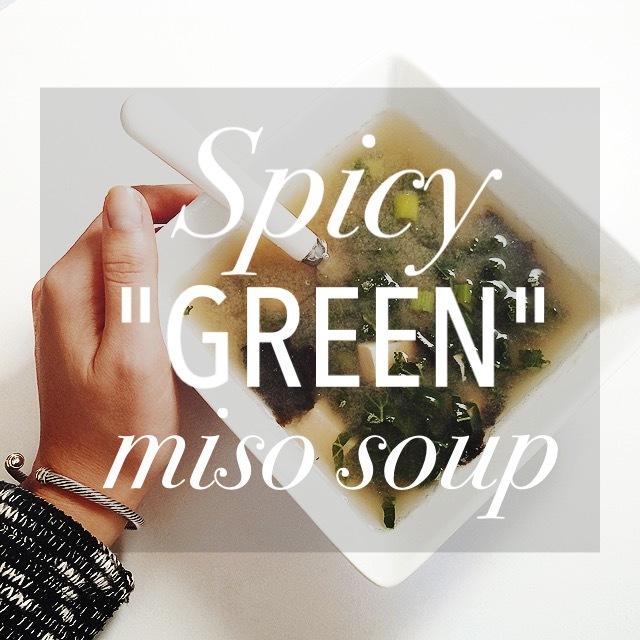 Drizzle with some sriracha and you have a deliciously different take on traditional miso: Spicy “Green” Miso Soup. Happy Meatless Monday! Happy Meatless Mondays! 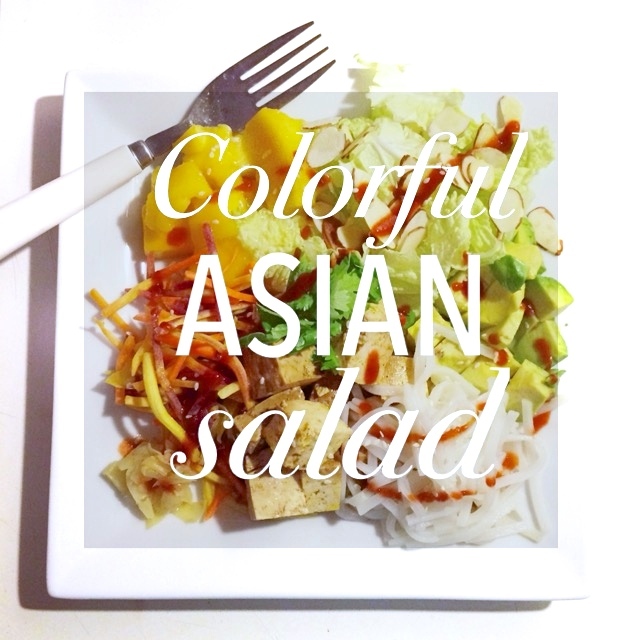 In honor of such a day, I created the Colorful Asian Salad. After having its inspiration at Stephi’s on Tremont, I swapped salmon for tofu because a). last week was too hot to use the oven; b). tofu’s cheaper; and c). tofu calls for an easier prep — chop, marinade and serve. Many different textures (and colors!) come to play to make this salad. The napa cabbage is a more delicate choice from the cabbage family. It pairs well with tofu, and I’m now itching to try it in a stir fry. The juicy mango doesn’t seem like an obvious choice for a salad, but the sweetness plays off the spicy sriracha and ginger and distinct flavors from cilantro. I definitely want to make this with salmon, but I think this salad is one that’s going to pop up again and again.